We put the new Hasbro game through its paces. But is it a smash-hit? By now, you've almost certainly heard of the original Bop It!, Hasbro's stick toy that tasks you with twisting a handle, pulling a lever, or smacking a Bop It! button in response to increasingly urgent voice commands from the built-in speaker. Addictive and infuriating, it can reduce otherwise healthy men to having spaghetti arms as the contact between panicking brain and muscle falls apart. Bop It! Smash for mobile devices is essentially a gaming version of the revised hardware device of the same name. 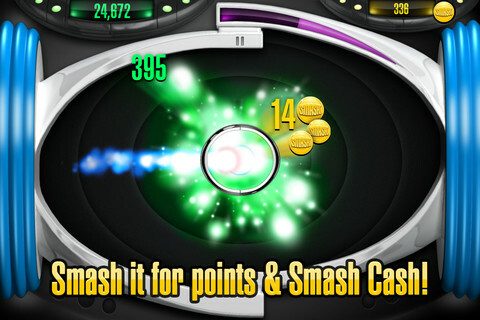 Rather than yanking and smacking a variety of handles and buttons, Smash simply requires you to push a button whenever the light(s) traveling around the screen, bouncing off the walls, arrive back in the centre. Get more points for scoring a bulls-eye target, or less for hitting just outside the sweet spot. As you reach higher and higher levels the game area gets smaller and smaller, ratcheting up the challenge slowly but surely. When the orbs return to the centre you need to tap the screen with precise timing. The 'Goals' system adds a little purpose to the proceedings, so you'll be awarded with a medal for reaching higher levels, achieving certain score thresholds, or making a certain number of perfect traps in succession. While it's true that these provide some purpose to the otherwise simple high-score chasing gameplay, you'll likely achieve most of them through the course of normal play, and aren't really objectives you can work towards specifically. As you play the game, you earn coins for your successes and these can be used to buy yourself a little bit of an advantage in the game's store. 'Do Overs' allow you to carry on after a miss, while 'Zoom' lets you start a bit later on in the game. There are also plenty of cosmetic options to acquire, such as prettier balls or varied backgrounds. The money you earn during gameplay can be spent in the store. It is a very simple game, but that also makes it a very accessible one that's perfect for family gaming. Unfortunately, we had a rather significant problem playing on our second-generation iPad. At some random moment in any particular session, we could depend on the game freezing for a mere fraction of a second. 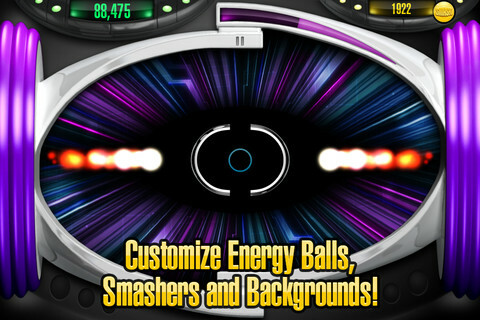 If the energy ball is far away enough from the centre, it won't usually impact on your game. If it happens near the centre when you're about to hit the screen for the score, it's very often game-ending. Frustrating. Taken as a bit of throwaway fun at Christmas, or passed around on an iPad at family events, there's something to be said for grabbing Bop It! Smash, especially as it's a free download. As a solo endeavor though, the rather simplistic gameplay, single game mode, and occasional hardware jitters make this game a rather difficult one to wholeheartedly recommend. What's Hot: It's a nice idea for a game and very well suited for family gaming sessions. What's Not: Fleeting freezes can be game-ending and there's not a huge amount of variety to be had from the gameplay.